Follow these steps to add users in the challenge group to an existing team, from the admin center. Team challenges can be set up in a few different ways; Users can join teams, create teams or be placed on teams. If you're looking to assign members to teams follow the instructions below. On board your members to the MoveSpring app, if you haven't done so already! You can on board them with or without a challenge group link. Go to your Groups tab and select into the correct challenge group. Toggle over to the Manage Participants tab along the top left corner of the challenge group page. 5. Use the Add User button to add all members to the challenge group. Select the name next to each user you wish to add. ***Once all members are added to the challenge group, navigate back to the group main page. 6.Scroll down to the bottom and select Manage Teams. 7. Select into the team of choice. 8. Use the 'Add User' icon to check the box next to all users you want to add to this given team. 9. Add all members to their respective teams. 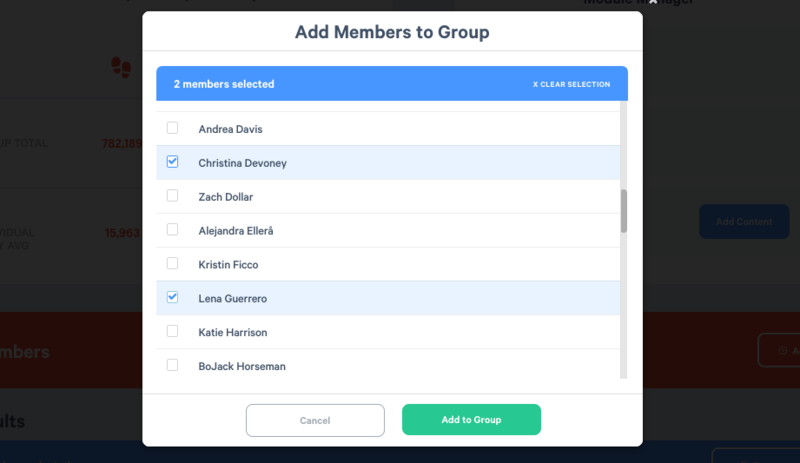 It's important to remember that all users will need to first be apart of the challenge group before you can add them to a team. If a user is removed from the challenge, whether they accidentally do it or it's done through admin, they must first be added to the challenge group and then their respective team.